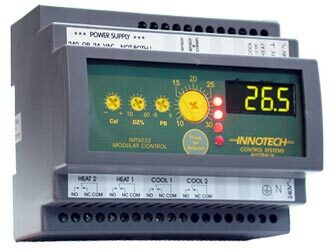 The Innotech Modular Thermostat is a device designed to control temperature in air conditioning systems. It is an analogue controller that regulates temperature of a conditioned space by switching heating and cooling systems as required. Tailoring of the control algorithm is made via screw adjustments that are accessible on the front panel. A knob on the center of the front panel sets the desired temperature. 1 stage heat and 1 stage cool analogue controller that regulates temperature of a conditioned space by switching heating and cooling systems as required. 2 stage heat and 2 stage cool analogue controller that regulates temperature of a conditioned space by switching heating and cooling systems as required. 1 stage heat and 1 stage cool analogue controller with display that regulates temperature of a conditioned space by switching heating and cooling systems as required. The current temperature and the desired temperature are displayed on a four digit display. The Set Point View button toggles between the two. 2 stage heat and 2 stage cool analogue controller with display that regulates temperature of a conditioned space by switching heating and cooling systems as required. The current temperature and the desired temperature are displayed on a four digit display. The Set Point View button toggles between the two.